So you’ve just bought that cargo trailer you’ve been wanting for your expanding business. 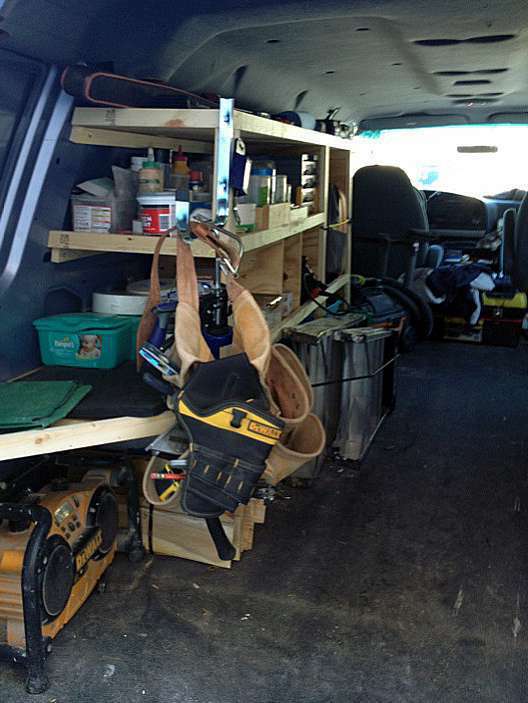 You want to put it to work right away, but first you need some kind of shelves and racks to store your tools and inventory. 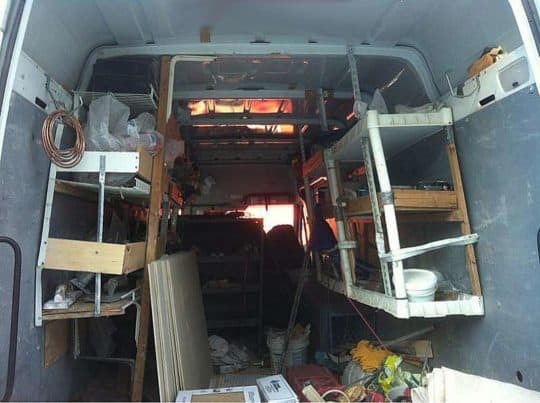 You’ve got a few good cargo trailer shelving ideas, so your first instinct is run down to the lumber yard and build yourself some quick DIY shelves. But hold on — is saving a few dollars initially on plywood shelves really going to pay off in the long run? Don’t be so sure; take a moment to consider these important facts. Plywood can be a good building material for many things, but is it really ideal for cargo trailer shelving … probably not. Wood is easy to build with, but it is heavy, bulky and weak. Wood is a natural material and as such it “breathes”. That is to say that it moves, it expands and contracts with the changes in temperature and humidity.Over time wood also tends to warp, sag and bend. Wooden shelves can become loose and rickety due to vibration, heavy use and seasonal changes. Do you really want your shelving to look like this? Manufactured shelves by contrast are built of steel or aluminum and are much stronger and lighter. They are engineered and designed to be more efficient with space. A manufactured shelf will not be affected by changes in weather or temperature. They won’t warp or twist and they offer more options for storage. A lighter manufactured cargo trailer shelf offers two distinct benefits over wood: more cargo capacity and less weight to tow around; which can save you considerable fuel costs in the long run. Shelving that is purpose built and manufactured specifically for cargo trailer organization is designed and engineered to last the lifetime of a service vehicle. It’s designed for heavy duty use by the most demanding of tradesmen. It’s guaranteed to be “contractor tough” to work as hard as you do, day after day, and year after year. DIY shelving on the other hand can only be as good as the carpenter who built them. Most dimensional lumber available at the home improvement stores is softwood and tends to still be a bit green when bought. Those 2 x2 studs that seemed so perfectly straight at the lumber yard can dry out to be twisted hockey sticks and affect the strength and function of wood shelving. You have to wonder if those door latches will still line up or if those drawers will slide smoothly after a year in service whether it is -10℉ in the winter or 90℉ in the summer. If you’re still interested in building your own cargo trailer shelving, here’s something else to consider: how much time will you spend on designing and building homemade shelving for your cargo trailer? You could just take your chances, but odds are your results will be less than ideal. To build anything that can really function well you’re going to have to do some research and design. That means taking the time to plan the layout, measure and calculate, then compile a materials list. Then you have to actually build the shelves. Just for the sake of it, let’s say that you’re a plumber and you would normally charge $80 hour. If it takes you a couple of days to build the shelves plus an evening or so to design, you could easily be looking at about 20 hours or more of work. Potentially that can add up to $1600 of lost billable time (20 hours at $80= $1600). 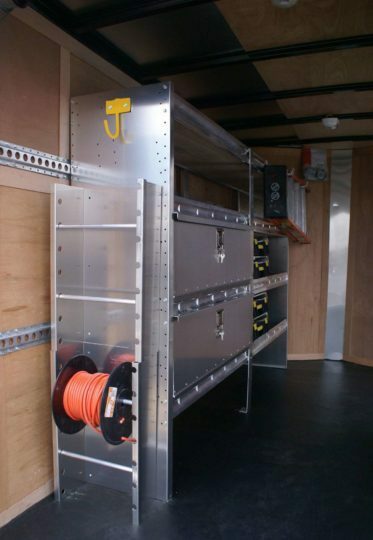 Ranger Design cargo trailer shelving with hook, wire reel holder and ladder rack hook shown. Speaking of design, how good are your cargo trailer shelving ideas? Will they be flexible enough to change or be modified easily later on? Will you be able to quickly find what you want? Or will you still end up wasting time, driving yourself crazy, digging around in the dark looking for that one piece of equipment you need to finish a job. How well will your DIY shelves organize and secure your tools? Will it keep them in place and stop them and valuable inventory from bouncing around and getting damaged when you hit rough roads or construction sites? The top manufactures of cargo trailer shelving have design teams that have spoken to tradesmen; they’ve listened to what they need and responded with innovative products and storage solutions that work great and last for years. They’ve researched and studied ergonomics to find the best ways to help you organize, save time and potentially work safer. They have designed “Systems” that allow you to add, change or modify the layout of your storage quickly and effectively without losing downtime rebuilding a home made shelf rack. Hopefully your business will continue to prosper and in no time you may want to sell or change you service vehicle. Consider that if you ever decide to sell your cargo trailer, generally your homemade shelves go with it and add no value. Manufactured cargo trailer shelves on the other hand can be reinstalled into other vehicles so that your investment continues to work for you. Should you decide to retire, and not need any mobile storage equipment, you could always sell your shelving systems on Craigslist or Kijiji and recoup part of your investment. Not so with your homebuilt jobs. Perhaps one of the strongest arguments for manufactured cargo trailer shelving vs homebuilt is how it looks. No matter how skilled a tradesman you are, sometimes it’s still the first visual impression that wins or loses a customer. You’ve worked hard on your trade and you reputation. You’ve invested in training, tools and the right equipment, but showing up at a customer’s house or job site with a trailer that has cobbled together racks, warped shelves, and old plastic storage bins, just doesn’t say organized professional. So really consider if building your own shelving and racks will really save you money in the long run. When you calculate the time and effort to build them, the short lifespan, and the loss of professional image what you save initially could cost you in the long run. Investing in professionally designed and manufactured cargo trailer shelves will help you become more organized and efficient. It will increase the protection of your tools and inventory and stay functional for years. Most importantly it will set you apart from the “jobbers” and add to your professional image. Find out more about Ranger Design Cargo Trailer Shelving here. Or, please give us a call at (800) 565-5321, contact us or request a quote. Wow! Very Informative! I won’t be going with wood from now on. Thanks for talking about how wood really won’t save you money in the long run. My husband is thinking of buying a cargo trailer and putting up some shelves in it in preparation for the business he’s working on starting. I know that he’s going to want to DIY it, and I don’t want his hard work to go to waste. Better that he start looking into steel shelves now than buy them later after spending money on lumber!